I've been in a bit of a cooking slump lately. I'm still cooking, but most of my experiments have not been coming out as well as I had expected (or hoped, more specifically). My cooking tends to run in phases. I will have a burst of creativity where everything comes together exactly how I wanted it to, or at the very least, it is a tasty deviation. But then there are those times when nothing comes together exactly as I had planned. I try to look at these as learning opportunities. It is all edible, just not something I would share with anyone. Add to that (or maybe because of it) the fact that I am working on my apartment and that is taking a lot of my time. I'm hardly even knitting these days. It's a good thing overall, but I can feel myself itching to get in the kitchen. I do have some projects in the works there, which I will share as they occur, but I haven't really had time to sit down and work out any kind of cooking plans so everything is kind of a mishmash and nothing is going together. Which is making for some interesting meals. Whenever I get disorganized in the kitchen, I tend to fall back on old tried-and-true standards. If they are long-time standards, I might play with them a little, but nothing too far outside the box. Take this chicken pot pie with a biscuit topping. 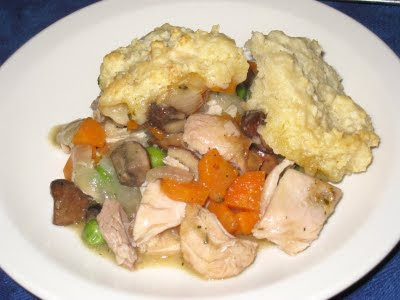 Some might say it looks more like chicken and dumplings, and they wouldn't be far wrong. They aren't quite as dense as dumplings are (at least the dumplings I have had - although I am from the south chicken and dumplings was not a standard in our house). I think one of the differences is that this dish is baked, and dumplings are usually cooked in a dutch oven, whether in the oven or on the stove top. One of the last times I made this dish, I used turkey that I needed to get out of my freezer, and I forgot the baking powder so the topping, while tasty, did not rise at all. This time I remembered baking powder, but I forgot the sesame seeds. Because it was a spur of the moment decision to make it, I did play with some of the ingredients. It came about because I needed a pot of chicken broth, but not the meat. I used several chicken quarters for the stock, so I had a lot of chicken for which I had no plans (and little inspiration). So I decided to make a version of my chicken pot pie. The only problem with that recipe is that it makes a small pie, to serve 2 people, and I had a lot more chicken on my hands than just enough for two. So I doubled the recipe and changed around the ingredients a little. I did not have celery, but I had some beautiful cremini mushrooms, which made a lovely substitute. I threw in some celery seed to replicate the flavor, and that worked. All told, the result was delicious. I am always pleasantly surprised by how flavorful this is. It's comforting and satisfying enough for a quiet night by yourself, and flavorful enough for company. The topping did not rise quite as much as I had expected it to rise, but in looking back I am thinking I did not double the baking powder. What is it with me and baking powder? No matter, it was still delicious. Place the chicken in a medium saucepan over medium-high heat. Add water until chicken is barely covered (at least 3 cups). Bring to a boil and lower heat immediately. Simmer the chicken over low heat for about an hour. Remove the chicken from the liquid, let cool, and cut into 1/2-inch cubes. Pour the liquid into a bowl, reserving 3 cups. Preheat the oven to 350 deg. F.
Melt the butter in the saucepan. Saute the carrots for 5 minutes, then add the onion and saute for 3 more minutes. Add the mushrooms and stir for about 2 more minutes, until the mushrooms have darkened a little and have absorbed some of the oil. the sauce has thickened enough that you draw a line through it on the back of spoon, remove from the heat. Add the peas and chicken. Pour into a greased 8 x 12-inch baking dish and set aside. For the topping, place the dry ingredients into a bowl and whisk together. Add the butter and cut it in with a pastry cutter, two knives, or your fingers. Add the milk and toss briefly but thoroughly until a sticky dough is formed. Drop by heaping tablespoonsful onto the chicken mixture. Sprinkle the sesame seeds evenly over the top. Place on a middle rack in the oven and cook for 30 minutes, or until the topping is browned and the chicken mixture is bubbling. Let rest about 15 minutes before serving.